Everyone has an Uncle Bob. If not, they have a relative equivalent to my Uncle Bob. For example, my Uncle Bob recently acquired a few live chickens (don’t ask how) and decided to raise them on a diet consisting exclusively of cheeseballs. Needless to say, the egg yolks are suprisingly orange. Another tidbit of information Uncle Bob shared with me is what many of his coworkers have for snack. Here’s what he divulged: They go to the vending machine, get a bag of salted peanuts and a bottle of Coke, pour the peanuts into the Coke and drink it. Simple. Odd. Delicious? Yup. I don’t drink much soda but Coke Zero is my favorite. Regular Coke is too sweet, diet Coke tastes awful, but Coke Zero has the perfect level of sweetness with a good flavor and an almost salty undertone. Salted peanuts compliment it perfectly. I must admit, I was impressed. Thanks Uncle Bob. 1. Funnel the peanuts into the bottle or pour into a glass and drop the peanuts in. 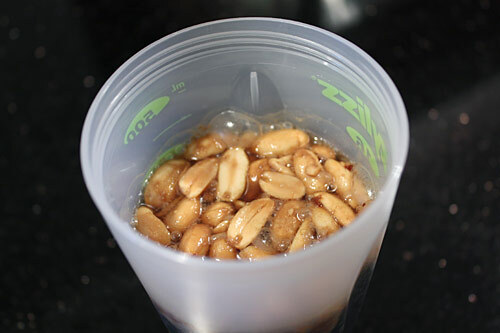 Drink within a few minutes for a crunchy, salty treat or “brew” for around 2 hours in the refrigerator for softer peanuts (closer to boiled peanuts). Drink/eat and enjoy! This doesn’t sound AT ALL appealing, but it’s one of those things I want to try now just because I’ve heard about it… I might need to lock away the soda from myself for tonight. I can understand that. The idea didn’t sound that appetizing to me either until I realized the sweet/salty thing that would be happening. And it happened! I have no clue how this will taste, but I MUST try it! Haha, you’ll have to let me know how you like it! It’s so nice to hear other people do this too. I am from Texas and in the small town where I grew up everyone did this. Except with Dr. Pepper instead of Coke. The big secret is you have to take one swig of the beverage first before you put in the peanuts. This is of course if you are drinking it from the bottle. If you don’t when you pour the peanuts in it will foam up and out of the bottle. It really is tasty. The saltiness of the peanuts compliments the sweetness of the Dr. Pepper. And Dr. Pepper is super sweet. Plus it’s a quick, easy snack. I usually do it when I’m in a hurry or traveling as I don’t drink soda very often. It’s a snack and a drink in one. Now I can tell my husband who grew up in Los Angeles that my home town isn’t so weird after all! Thanks!! You’re right! I forgot to mention you need to take a swig first, I’ll add that! So Dr. Pepper huh? I just tried Root Beer and it was fantastic, Dr. P is next! When I was a child, my choice was an Royal Crown Cola and peanuts. No other brand of drink tasted as good as Royal Crown.If the peanuts are not available, then a moon pie went with the Royal Crown cola. If I had to drink a Coca Cola drink, it had to be the original coke in the small glass bottles. RC Cola – need to add that to my to-try list. I’m really starting to like this peanut-soda idea. This sounds like a very tasty snack! I guess one needs a spoon to reach to the bottom of the cup and eat the peanuts, after the drink the Coke. Honestly, I don’t know what to think, but I bet its awesome. Its got the whole sweet/salty mix going on. Which, if you think about it, is the same concept as a peanut butter and jelly sandwich, which gets its sweetness from the jelly! Boom – you nailed it! Well so far it looks to be a southern US tradition. As for the nuts, they don’t flavor the soda so much as adding to the flavor experience. When you drink a gulp with a peanut in it, you first get the sweetness of the soda and when you chew the peanut you add the salty nuttiness flavor to the mix, transforming your soda into a full-blown gourmet snack =). I think this could be quite different, for I love me a lil’ sweet/salty mixture. I wonder how it would be with Rootbear??? I don’t really drink soda, but this might be fun to try out this weekend at a BBQ. I just tried it with a can of diet root beer – it was fantastic! I like it even better than the coke. I highly recommend it! Nice! I didn’t know that! Thanks for the history lesson, I need to find out more. My gosh, if only I had known! I need to get another recipe up quick to push this one down before he goes on a rampage! It’s really addicting! At this point, I’ve actually transitioned to Root Beer – it’s even better! I grew up doing this too….when we would drive by a certain little store in southeast southern Illinois, I would always have to stop and get a “cold” bottle of pop out of the cooler and pour a bag of peanuts in it. The first few drinks of the Coke with the bubbly salty soda were the best. That store is gone now and I miss doing this. Thanks for the memories!! Sure thing, glad you could relive that moment. Now go out and do it again by getting your Coke at the super-mega-mart that replaced that store! OMG, I used to have this almost all the time at school!! Well, you gave up coke but did you give up root beer? I found a great diet root beer and actually prefer it to the coke now! Hey, it’s no different than coffee with a spoonful of peanut butter, right? Go for it! I’m from the South and had an Uncle Bob (mom’s baby brother, he passed away a few years ago). Uncle Bob’s are the best! Anyhoo, being from the South, peanuts in a Coke or Dr. Pepper is what it’s all about. It’s the sweet and salty thing. Thanks for sharing! Did it when I was a kid in Arkansas in the early 1960’s. It had to be a small 6.5 oz bottle of coke, they taste better!! !